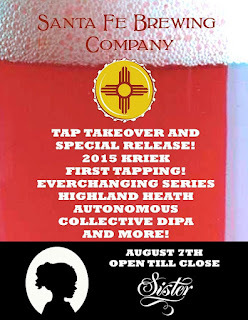 While Albuquerque eagerly awaits the opening of Santa Fe Brewing's new taproom off of Carlisle Blvd. (expect a soft opening late next week), we can take solace in the tap takeover tonight at Sister Bar. Highland Heath (barrel-aged Scotch Ale, part of their Ever Changing Series and available in bottles at Jubilation), Autonomous Collective DIPA (exciting to see Santa Fe doing a DIPA, as it's not something you think of when you think of Santa Fe Brewing, unless you can remember back to Imperial Yippee IPA. Oh, the times, they are a changing), and the first tapping of the 2015 version of Kriek. The 2014 version earned a well-deserved medal at the past GABF. For some reason, Sister always seems to have these tap takeovers on Friday nights, so I won't be able to attend. But when I found out the takeover coincides with "Honky Tonk Happy Hour", which consists of Steed spinning "classic country, honky tonk and western swing records from 5-9 pm", I realized I could probably survive without making this event. I'm hoping that DIPA is still around for me to try on Saturday, but I wouldn't bet on it.